Autoglym has partnered with Concours of Elegance since the event’s inception three years ago. It was a natural choice given Autoglym’s vast technical and practical experience in caring for priceless vehicles. We caught up with Autoglym’s Technical Director Paul Coley and the Technical Services Manager Ade Potts to learn how the company will prepare its products and staff for the Concours of Elegance. The age of the vehicles on display this year spans an incredible 118 years. How have the materials used evolved over time and what problems can affect a classic car of this age? PC: UV light and time are the biggest. UV rays are very good at breaking the bonds in paint, regardless of the paint colour and type. UV damage is still an issue with modern paintwork. The pigmentation has improved, so you rarely get heavy colour fading, although UV will still attack the clear coat layer and cause roughness. Any rubber areas on the car can dry out and crack as they lose the plasticisers that keep them supple. The key to preventing damage is to keep these areas protected with a UV barrier. Is there anything older vehicles excel at? PC: Yes, the leathers are very robust. The old tanning methods gave a superb finish and they wear incredibly well. You will be using new products that were developed years after many of these cars were built. How do you ensure that any products developed in the lab today are suitable for the cars of yesterday and tomorrow? PC: Ensuring products work on older vehicles is easy. We are fortunate to have close links with several motor museums and significant historic collections. We also keep a full catalogue of historic paint plates, rubbers and leathers to test on when carrying out development work. Tomorrows cars are always a guess. We never knew that satin and matt paintwork would take off, but by adapting our application techniques we actually found that our existing product range was perfectly suited to this new paint type. We always try to anticipate developments in vehicle manufacture and ensure that our products are incredibly safe to use on any surfaces of the future. Moving to the practical elements of concours car care, what skills do the event team require when working on these vehicles and how do the staff prepare for an event? AP: Everyone needs to have an eye for detail and a real enthusiasm to help maintain the cars on display. We always have a vehicle orientation where we’ll learn about each of the cars on display and any points of concern to be aware of. How do you care for an original unrestored car versus a fully restored example? Do they require a different approach? When the vehicles are delivered by the owners we have an appraisal together and any delicate areas are pointed out. The restored cars are generally fine as they have often been brought back to a new condition; it is the original cars that can be tricky. The key is to maintain these vehicles, not attempt to renovate them. A good relationship with the owners is essential, not least because they can help with practical things such as where the covers are stored and how to get into the boot, it isn’t always obvious! What kind of things can the events team encounter on the concours? AP: The Great British weather can be an issue. We can have sunshine one minute and monsoon conditions the next. Changing weather requires a different set of products and techniques so we need to be ready for anything. Some members of the public can also get a little close to the cars on display, so we have to keep an eye on loose umbrellas and bags that can easily mark paintwork. 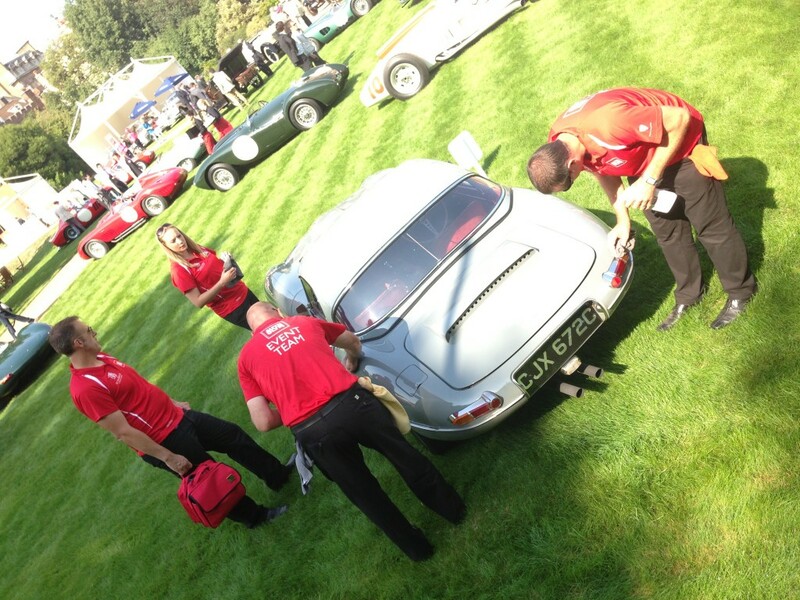 How many staff do Autoglym take to the Concours of elegance each year? We try to involve as many staff as possible. It is a great chance for everyone to experience such a prestigious event. There may be 10 staff on duty at any one time, but we will take 25-30 if we can. The whole team look forward to the Concours of Elegance, it is a lot of hard work, but the opportunity to work with these vehicles on a Royal lawn is a really special one.